The Nano Twist Music Premiere – a result of the intensive toil of artist promotional website Songdew, along with Nano Twist – has been keeping the hullabaloo alive by releasing a range of songs online, one after the other. 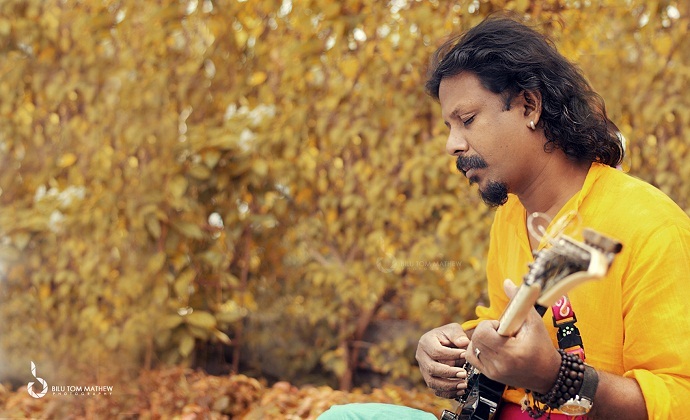 One of the recent releases was a song titled ‘Moham’; a creative product of one of the most revered guitarists in the country, Baiju Dharmajan, also popularly known as ‘The God of Small Strings’ for his exceptional command over the instrument with a specialization in Carnatic rock. Released on the website for free streaming, and available as a download for a measly fifteen rupees; the stakeholders are leaving no stones unturned to make the song ringing in the ears of a wide variety of listeners. On this occasion we had a chance to speak with guitar god Baiju Dharmajan, who enlightened us on several aspects of the song along with his future plans, and his opinions on such initiatives of which he is a part. As regards the song, and how it differs itself from his other illustrious projects, Baiju said, “There are three musical directions I’ve taken of late: one with taking the Carnatic rock/metal kind of stuff forward with the Baiju Dharmajan Syndicate; one is with collaborations with various musicians I admire and respect; and, the third is to release some music on my own. ‘Moham’ is one such release, a rendition of the classic number ‘Moham Kondu Njan’, composed by the Late Johnson Master.” Moreover, we were told that the song was in fact an accident, and came into existence only after a bout of random playing while working on another piece. In addition to this, we also shot up a generic question on the contributions such initiatives are making towards the underground music scene in the country, to which Baiju had to say, “Songdew has been doing a lot of good stuff for the indie scene of late, and this was one such initiative through which they helped reach the music to a large audience.” The way in which this initiative is making diverse music available for the ‘net’-izens, could serve as a prototype for other companies even remotely associated with music. Lastly, talking about his future plans, Baiju said, “Very recently, I’ve launched my first crowd funding campaign, through which I’m inviting close friends and family, to contribute towards my upcoming music video for the song ‘Kaithola’. The campaign had gone live on Wishberry a few days back, and the initial response has been tremendous. Also, going to release a single in the coming month or so with the Baiju Dharmajan Syndicate.” With such a hectic blueprint for the near future, it seems that ‘Moham’ has only been a beginning from where we can look forward to a host of other releases, which would exude Baiju’s signature, Carnatic-inspired playing style. Listen to, and download, 'Moham' by Baiju Dharmajan here. With the launch of Music Premiere, Nano Twist in association with Songdew have joined the bandwagon of organizations striving to promote the music of independent artists across the nation. With some seasoned musicians in the fray, audiences can look forward to experience some diverse sounds. Bangalore Open Air have announced the 2014 edition of the festival to be held at CounterCulture on Septmber 13.